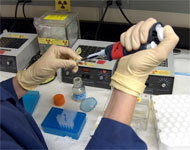 Spoof news: Michael Jackson DNA Stolen From Lab! Michael Jackson DNA Stolen From Lab! A laboratory trusted with DNA samples of Michael Jackson has admitted that the samples have been stolen. "We here at the Jolins Lab try to keep everything locked away, even to the fact that most people think we are a medical supply company", stated Dr. Landis Plume. "Last Friday, the Jackson DNA was here, now it's gone." A company securtiy officer was posted all weekend but local police called in, believe the officer was given something in his coffee to make him sleep. "He can't account for 4 hours Sunday night. There are no entries in his log and he can't remember anything special during that time. He stated that he thought he had just dropped off for a few minutes at around 2AM but became suspicious later when daylight came so soon." Dr. Plume stated that not only could the DNA help produce future Michael Jackson children but that a recent breakthrough, little advertised, could make a person's body absorb the DNA and pass some of Jackson's natural abilities onto the body through implants. For the latest on this, there will be a special report at 11PM on CNN. In other news, Larry King has signed up to appear on "Dancing With The Stars" this fall. Larry claims that he simply felt that he wanted to get out of his chair sometimes and "shake a leg, do one of those goon walks." "Besides, I'll keep a medical staff handy like Vice President always did, probably still does."